The origin of Chess from the land of India â€“ a game that will transport you back through the ages, back to the time of the Vedic Rajas of India. Chaturanga is well recognized as the earliest form of chess. Played on an authentic cloth game surface by 2, 3 or 4 players, Chaturanga combines the basic strategy of chess with the dynamic challenge of chance as each move is determined by the random roll of wooden dice. 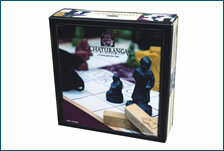 Whether you are playing for treasure or fun, Chaturanga is a great game for the entire family.